JULY 2013 VOICE: At times, Association members, affected by the Windfall Elimination Provision (WEP) and Government Pension Offset (GPO), may feel that they are alone in the fight to repeal both dreaded laws. JUNE 21, 2013: Members impacted by either the Windfall Elimination Provision (WEP) or Government Pension Offset (GPO) received reason for increased optimism that the two regressive federal laws days may be numbered. Following an earlier bill (HR 1795) filed in the House, Senator Mark Begich (D-Alaska) has filed S.896. The bill now has 9 cosponsors from across the political spectrum, including Massachusetts Senator Elizabeth Warren and Maine’s Susan Collins. JUNE 11, 2013: Support for the recently filed H.R. 1795 has grown to 61 cosponsors over the five week period since the bill was first introduced. Sponsored by Republican Congressman Rodney Davis of Illinois and Democrat Adam Schiff of California, H.R. 1795 aims to fully repeal both the Windfall Elimination Provision (WEP) and Government Pension Offset (GPO). The trustees of Social Security recently reported that the retirement system can pay full benefits until 2035, when it will be able to pay about three-fourths of promised benefits. That is not a crisis. It is a manageable problem. 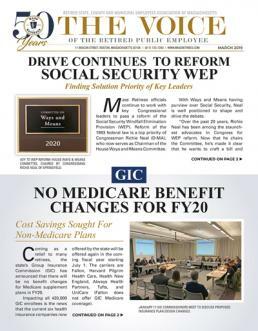 May 1, 2013: Congressmen, from different states and political parties, have joined together to hopefully correct a longstanding problem that they share in common – and with us here – namely, Social Security’s oppressive Windfall Elimination Provision (WEP) and Government Pension Offset (GPO). MARCH 1, 2013: On the day when federal sequestration took effect and with a major retiree healthcare reform bill now pending on Beacon Hill, Association officials wrapped up the week by participating in two important forums: A conference call with Massachusetts’ Senior Senator and participating in the AFL-CIO’s Leadership Conference. FEBRUARY 2, 2013: This past week, the Association took part in the annual National Conference of Public Employee Retirement Systems (NCPERS) Legislative Conference held in Washington, D.C. While a variety of pension, healthcare and Social Security issues were discussed, one issue was on the top of our agenda – WEP & GPO.